Imperial One Limousine provides professional Limousine Service to the Clearwater, Tampabay area -our blog provides opinions, advice and tips on limo rental for the limo renting consumer! Who's been in that limo? It was just the other day that I realized how interesting and diverse our clients have been. 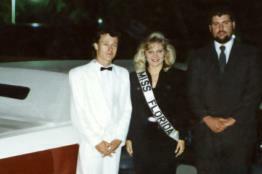 We have had groups of doctors, chefs, attorneys, bands, secretaries, girl scouts, coast guardsmen, swat team members, firefighters, the owner of a nationwide chain of fast food restaurants and a group of jockeys from Tampa Bay Downs, 1 Limo was used in a music video shot in Orlando, another was used in an episode of a reality show shot in Tampa. We have provided service to worthy causes such as the 'Littles & Middles; Prom' for children with cancer and their families and we shuttled people to and from a fundraiser for abused & abandoned former circus animals. We have taken many children to Proms and out for Birthdays, driven many Brides & Grooms off into the sunset and helped many other groups celebrate their events safely and in style. -So you see the answer to the question is not so simple, and maybe the next time it's asked of us -the answer will be YOU!! QVM rules state that only Lincoln Town Cars, Ford Expeditions and Lincoln Navigators are approved for conversion into a stretch limousine. In addition, QVM rules specify that a Town Car can only be stretched 120" and Expeditions and Navigators 140" (basically, about twice the normal size). When it comes to wedding transportation, almost always a long stretch limousine comes to mind. Sometimes, if you're the inquisitive type, you might wonder just how did people start using limousines for wedding transportation. You may ask, “What did they use for transportation at weddings back in the late 1800's and early 1900's?” Well, wedding transportation has a long and interesting history that is worth examining in closer detail. The first wedding transportation methods were designed to carry the bride and groom in as much comfort as possible on their momentous day. To do this, carriages that had once been stagecoaches were converted to opulent horse drawn vehicles that had hard rigid bodies with luxurious interiors. These were designed with comfort and protection from the elements in mind. The interiors of the stagecoaches would be decked out with plush velvet cushioned seats, walls, and ceilings in order to provide the most comfort when riding the rough and rugged roads that abounded in the country during the 1800's and very early 1900's. The idea was to make the ride as smooth as possible for the bride and later the matrimonial couple. In addition to plush interiors, extra springs and shocks were added to the suspension of the stagecoaches in order to smooth out the ride. Sometimes, even the horses themselves would be given specialized horseshoes. These were designed to try to stop the bumping that could occur from them stepping the wrong way on the rough roads. As time progressed, and cars became more prevalent, the converted stagecoach method of wedding transportation changed into a more recognizable mode of travel. With the invention of cars, roads began to be better constructed and as such wedding transportation evolved into the predecessors of today's limousines. One of the first vehicles to be used as a limousine type vehicle was an enclosed movie set truck. These were designed for moving large crews and sensitive equipment from one set to another on a movie studio lot. As such, they were ideally designed to provide a smooth ride. By taking these trucks and enclosing their beds with a passenger cabin and then installing luxurious interiors, wedding planners were able to create some of the first vehicles that were truly designed to transport brides and grooms in comfort. One of the most famous of the early wedding vehicles that early 1900's wedding planners used was the 1908 Studebaker. As time went on, Studebaker became a legendary limousine brand in the 1930's and 1940's. Movie actors and actresses were seen all over Hollywood being transported in Studebaker limousines. Anyone who was a VIP always had a Studebaker limousine at their wedding. Seeing this growing market, the major auto makers like Lincoln, Chrysler, and General Motors all wanted a piece of the action. Since the 1950's and up through modern times the major auto makers have taken over the market, and the limousine has become synonymous with a vehicle that abounds in luxurious accessories. Whatever type of limousine one can think of from a Lincoln, to a Chrysler 300, to a stretch Hummer, all of them have one thing in common and that's luxury. When it comes to wedding transportation in the present era and arriving in style, these vehicles certainly deliver. The bride and groom now have luxuries from an in car bar to a television. This is certainly a far cry from the olden days, when the best they could hope for was a smooth ride on a rough dirt road. We're all used to the commanding sight of a Hummer SUV on the street, but few are aware of the rich history behind one of the best off-road vehicles. Outside of its civilian use, it was actually employed strictly by the military back then. The history of the Hummer began 30 years ago in the US military. In the 1970's, the US Army concluded that its militarized civilian trucks no longer satisfied their requirements. They needed a new strain of vehicle. In 1979, the army drafted a design for a High Mobility Multi-purpose Wheeled Vehicle (HMMWV) or the Humvee. It was designed to be more agile and have exceptional speed and mobility. In just 11 months from conceptualization, they were already testing the first prototype, the M998. In 1981, AM General requested a contract to develop several more prototypes including the more muscular breed that the Army required. They were awarded the initial contract of producing 55,000 Humvees for delivery in 1985. All were sold to LTV Aerospace and Defense Company as the AM General Division. An additional production contract for 33,331 military vehicles was awarded to GM General in 1989. Then in 1990 came the initial design for a civilian prototype, which was then called the Hummer, "the world's most serious 4x4". The vehicle was patronized by civilian users who seek the ultimate in toughness and mobility, and they appreciated the value of the Hummer's long life and astonishing performance. March 1992 marked a milestone in the history of the Hummer with the production of the 100,000th military vehicle. In April, the company was sold to Renco Group, Inc. In December 1999, GM acquired the exclusive ownership of the HUMMER brand worldwide and the existing HUMMER was renamed the HUMMER H1. AM General began assembling the "next generation" sport utility vehicle designed by GM, HUMMER H2, in 2002. In 2005 General Motors released the 2006 HUMMER H3 midsized SUV. Over the years, the HMMWV has proven to be an asset to the military. It has played an important role in military actions worldwide. It was just a matter of time before its benefits were recognized by the civilian sector. Aside from a few refinements for comfort and practicality, the Hummer is virtually unchanged. It maintains all of the power, sturdiness and versatility of the military Humvee. Today, some of these amazing features are incorporated into our Hummer H2 & H3 limousines. We have grown, and today is a good day! Today by early afternoon I could think of about a half dozen reasons to be unhappy: unfinished projects, fuel costs, insurance costs and annoying competitors wasting my time would top the list. Then in a quiet moment I realized that some of these are good problems to have. If we weren't busy we wouldn't have high fuel costs. If we didn't have good cash flow we would never have started the projects that aren't finished. If we weren't a serious threat to our competitors they would not waste their time with us. I was very happy to come to the realization that we can no longer claim we are a 'small' company. We have a few competitors who cliam to be 'The Biggest' which was never a particular goal of mine. My goal always has been to try very hard to be the best. I don't mean that in a 'win at all costs' way like some of my competitors. I mean it in a 'do the right thing and earn repeat customers' way. We now have 8 Limousines: 4 Stretch Car Limos and 4 Stretch SUV Limos. Now this may not sound like a lot, until you look closely at most of the limo companies in the Bay Area. Many of them boast having a 'Huge Fleet' . Which is true to an extent, but what does that really mean? What it means is this: They are also counting sedans, vans and buses. Imperial One is a Luxury Limousine Company, which in my book doesn't include sedans, buses or vans. I have no intention of ever entering into the sedan or bus business. I think those businesses have very little in common with Luxury Limousine Service and far more in common with a taxi service. Now this is just my opinion and like all opinions is subject to debate. Based on a count of actual Luxury Limousines there are only 3 or 4 companies that come to mind as having more actual Limousines than Imperial One. And all of these companies have been in business for several years. So today is a good day, Im proud of the company we've built and thankful for our dedicated staff who have worked so hard to make that happen. Travel Safe and In Style! With increased pressure from law enforcement, driving under the influence puts good people in bad situations. This usually happens around the holidays adding unwanted stress at a time you don't need any additional stress. Imperial One Limousine is on a mission to do our part to make going out for any occasion safe and enjoyable. With a little planning and coordinating a small group can be assembled and plans can be made. The cost already minimal can then be divided among all participating parties. Everybody can then enjoy themselves knowing everybody else is doing the same and all will arrive home safely. Remember, 1 DUI will cost about $10,000 compared to one of our stretch SUV's for 6 hours at an average of $635..........As you can see not only is renting a limousine cost effective it's exercising good judgement. Enjoy this up coming holiday season and all other occasions, have a great time and Rent A Limo! According to AAA, October 31 is the deadliest night of the year for pedestrians. Children in costume walking through neighborhoods combined with adults going to and from costume parties can be a recipe for disaster. We can help make it safer for everyone concerned. If you’re going to an adult costume party a limo will not only make it safer but also a whole lot more fun! A limo can be great fun for the kids on Halloween too. You can use it for a rolling costume party before or after trick or treating or you can take your group out to watch a scary movie to get in the spirit. No matter what you choose to do on Halloween stay safe, have fun and don’t be a statistic! What is a life worth? How about five lives? The answer to that would have to be priceless, but the limo fire that caused the death of five in California could have been prevented for just $199. In light of what happened in California why would anyone take the chance of a repeat occurrence? We are not willing to take any unnecessary chances when it comes to safety. Whether the limo service in California knew the vehicle had suspension problems prior to the fire is something that will probably never be revealed. Air Suspension has been a problem in Lincolns for a very long time. Here at Imperial One Limousine we take safety seriously. We opted to remove the air bag suspension from limos in our fleet. The conversion swaps the problematic air bags out for coil springs that were specifically designed to support the weight of a limousine. We wouldn’t expect you to settle for anything less. Who am I to judge.. Yesterday was a slow but memorable day. Three phone calls in particular stood out. The first was a Mexican man who made a reservation for a Quinceanera. We do a lot of these and for those who don't know it is a 15th bday for a girl and is a very big deal in their community. It's a formal event and these families frequently spend almost as much as you would on a Wedding. He said that he reserved with us because we have a very good reputation in the Spanish speaking community. This was great to hear and reminded me of a situation from 6 or 7 months ago. A man walked into our office and he was wearing work clothes with paint on them. That didn't phase me because my father was a carpenter and when your out working your going to look like that. The man told us he had just stopped at another limo companies office and they ran him off before he could explain what he needed. He said they told him you don't have any money get out of here. The company who did this was the largest company in Pinellas County at the time. It was owned by a little man with a HUGE ego. They have since went out of business or actually merged with a company in Tampa, he's out of the business and their office on 19 now stands empty. The man with paint on his clothes didn't book a limo that day, he booked two! The second was a Russian lady who reserved a limo for a night out. She said she was booking with us because she was referred by a Russian couple who used us for their Wedding two years ago! It was starting to feel like an international type of day but my last caller was as American as they come. This guy is a frequent customer who's name I always manage to forget. Then after a sentence or two it all comes back to me. I'm proud to have him as a repeat customer. I'm proud because this was one of the most difficult customers to book that I have ever seen. Dealing with him reminded me to try my very best to be patient with people. The first booking he made was a lengthy process which took 10 or 11 phone calls. Yes 10 or 11 no exaggeration. Each time he would call we would go through his whole plan for how he wanted to surprise his fiance for her anniversary then after 20 minutes or more he would say he would call another time to reserve. Then one day the phones were ringing back to back and he called. My patience was at its very lowest. I told him that by this time I have now spent more time on the phone with you then you were even planning to reserve for and I don't wish to continue this interaction. Of course I immediately knew this was the wrong thing to do. It's one of those times that you can hear the words coming out of your mouth and know that it is going wrong. I called him back a short time later and apologized for not being more patient. Now some 3 years later he has rented every limo we have with the exception of our two newest additions and he just reserved one of those! So we try our very best to understand those who's language we do not speak, to be patient with those who's ways are different than our own, and to not be judgmental with those who others would tend to judge. Deals, Discounts and other forms of Manipulation! I often wonder if the public really realizes when they are being manipulated by sales, discounts and deals that often aren’t deals at all. I will occasionally get a call from someone that requests a quote then says, “Company ABC will give me a free hour, why won’t you?” When I hear that I know I’m in for it, trying to explain that they really aren’t saving anything is not that easy. Most companies won’t even try to explain because they consider this to be an undesirable type of customer in the first place. I don’t feel that way. I think everyone is entitled to shop around and try to find the best bargain or best service to suit their needs. I also don’t mind helping them find the truth. Most of the time our rate is far better. Sometimes it isn’t and if the rate they claim to have received from another company is better than ours I say “That’s a great deal I think you should take it.” More often than not the company offering a free hour with a 5 or 6 hour rental is charging a much higher per hour rate than we are and may also charge other fees. I try really hard to not ‘give up’ on the person if I feel they are being taken advantage of but honestly at times I think I should just let them go and pay more for less. Here’s an example: if Company ‘ABC’ rents a Hummer Limo for $150. per hour plus 20% gratuity and gives the 6th hour for free- 6 hours would cost you $900. Now our rate at Imperial One for a Hummer H2 Limo is $110. per hour and we don’t charge gratuity or any fees, so 6 hours in a Hummer H2 Limo from Imperial One would cost $660. That’s a big savings but some people are easily fooled by the offer of a ‘Free’ hour. A phrase often credited to P.T. Barnum said it best, “There’s a sucker born every minute.” This phrase fits for two reasons: 1) It’s true, some people are just too trusting. 2) P.T. Barnum never actually said that, although it’s been attributed to him since the late 1800’s. Sometimes you just can’t believe everything you read! It doesn’t matter what you want. Several years ago when we made the decision to start Imperial One I spent a few weeks trying to locate the limo we would launch the company with. At the time I was working for Baycare on a Crisis Stabilization Unit and had to really cram my research in on my days off. Many people will tell you that advice is worth what you pay for it and therefore Free Advice is worth nothing. I haven’t found that to be the case although I’ve never been one to easily accept advice either. I came to this endeavor with just enough knowledge to be dangerous. I knew a little, having had limousines off and on since the late 80’s. My knowledge was really dated though, having come from the pre Google- Phone Book days. So I made lots of calls. Took a handful of trips here and there to look at limos which didn’t amount to anything. Then I made a phone call to a broker who sells lots of limos. I called him looking for a specific limo I had seen in an ad. I said, I want – and that’s as far as it got. He cut me off by yelling- It doesn’t matter what you want! He proceeded to qualify that statement by explaining that I should leave my personal preference’s out of it. I didn’t realize it at the time and didn’t even care, but he was right. My defenses were up because some man had just screamed at me when I was trying to buy a limo from him. Needless to say I did not buy anything from him. Over the last 8 years it’s been easy for me to see the many ways he was right. I like red, if I had my preference I’d paint all my limos red- and guess what- no one would rent them. I saw this play out live when about 6 years ago an acquaintance of ours who owned a bus company went on vacation with his girlfriend and bought a pink limo on a whim. He asked if we would keep this limo at our office and rent it for him as he wasn’t having any luck with it. We tried to help but didn’t have any luck with it either. It went out twice in 6 months. Now this was a nice limo. If it had been white I probably would have rented it out nearly 50 times in that same time period. So while I was able to have 2 red limos in the 80’s because I wanted them, that day has past. Now my responsibility as a business owner is to offer what my customers want, but I really wish you all wanted red! Don't rent your limo from a marketing company, use a limo service! Almost every week an employee or customer will tell us about a 'new' company that has just popped up out of thin air. These companies usually have generic names that utilize specific geographic keywords in them. Google maps are loaded with these pretend companies. The way these marketing companies work is by selling leads to real local businesses or by taking the reservation and then farming it out to local companies. This is not good for anyone involved (except the marketing company). It's terrible for the customer because they really have no idea who they are doing business with. It's bad for the local companies because they are now paying a marketing company from another state to compete for local business. And most importantly it drives the price of the rental up for the customer. Simple fact is that people who do not own limousines cannot rent limos cheaper than people who do own limousines. There is no need for these middle men to exist and no benefit whatsoever to the end user of the service! So the next time you reserve a limo make sure to ask if they are an actual limousine service. Prom Season is here again. We see the same pattern repeat itself each year. Weddings typically reserve way in advance and Proms, Birthdays and other events wait to make reservations until a short time before the event date. They are then frustrated at the limited availability of limos. So if you have an event coming up in the next few months that is important to you- start making plans now. If you wait, it may simply be too late. As I write this (02/13/17) I have been taking calls all day from people who want to make a reservation for Valentines Day which is tomorrow. I have had to turn all of them down because we are already fully booked. So if your children having a limo for their Prom is important don't wait til the last minute and expect anything to be available.